This entry was posted on Thursday, January 21st, 2010 at 3:23 am	and is filed under Conservation. You can follow any comments to this entry through the RSS 2.0 feed. You can leave a comment, or trackback from your own site. Thank you Bjorn, I will forward this around to the powers that be and show them what there are people who really care about the status of not only our fishery in Puerto Rico but the world over. All Hail Belize!! PR bonefishing is one of the best kept secrets (big fish!!) and so sad to hear these trophy sportfish are needlessly being caught in gill nets. Repeated netting will devistate this population quickly. Time we all step up and put an end to this. I agree… it is time to put an end to it, just hope the political will can be found. Very danger and critical situation for myself and the other captains on the island, since we dedicate ourselves to guiding fishermen that visit Puerto Rico purely to chase after Tarpon and Bonefish. Upon seeing gillnets on the flat and the dead Tarpon and Bonefish I could not help to think that our industry of sport fishing could be in danger of extinction. For all a great loss, not only because of the elimination of Tarpon and Bonefish but also for our tourism. Yes, our tourism! The sports fishing industry generates millions of dollars that are spread all over Puerto Rico. I not only refer to all our hard working captains around Puerto Rico that promote and protect our so many marine species but to the entire tourist industry. From the baggage handler at the airport, the taxi man and car rentals, lodging establishments big and small, the many restaurants and others. This just a small list of the people and business that benefit from the fishermen that visit to our “island of the charm”. The Bonefish and Tarpon, aside from being an extraordinary fish with its beauty and pure untamed force, is not a fish on high demand for the plate. The truth is that the Bonefish and Tarpon are worth a lot more alive than dead. Studies have been done in the Florida Keys where it has been confirmed that the value of a swimming Bonefish is close to $3,500 , of money brought to their tourism. This is the value of just one fish of approximately 300.000! If we could just visualize that our Bonefish, Tarpon, and all of our marine species for that matter, in Puerto Rico have that type of potential the time is now to take action and make sure we protect our marine life! There must be many courses of action to assure us that there’ll always be Bonefish and tarpon in our flats and our waters. As I commented previously, this is not an attack to the gillnets but we must find a way for all of us to fish without having to erase the species from any particular area. 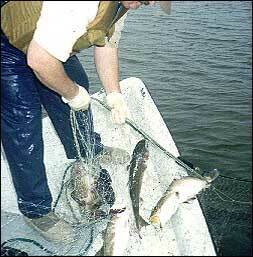 Tough to practice “catch and release” with the gillnets like we do in sports fishing. The Bonefish and tarpon are already protected in our Law books there must be ways to protect them in the water!! Should be a red flag for all, we could use as example the southwest of P.R. and the island of St.Croix. Two areas in which the Bonefish abounded and after years of abuse with gillnets they have disappeared! Still today they’ve not returned to those areas, which tell us, once they’re gone, very strange chance of them coming back! The ecological impacts of eliminating these predators of the skinny water alone should be sufficient to put us in action. Is time to the authorities to do something on the matter . Thanks Captain, that’s very well put. I hope something can be done! It’s a shame this things happen, but is the truth!!! I’ve had the pleasure to fish this flats with Capt. Rosario and they are truly amazing! !White sandy bottom,coral structure,deep channels, crystal clear water, lots of food but very few bonefish. I’ve seen some of the methods used by this people,for example they put the gill net at the very end of the flat.Then they go where the flat starts , they trow rocks and stomp on the water to scare the fish so they can be led to the nets.Others put their nets in river mouths and left them there for a couple of days. Another serious problem is octopus and conch fishing, everyday,everyday people stalk the flats for them. I can’t imagine the stress these species are being put up to. Anyway i believe that Puerto Rico it’s still a great place to visit for monster Tarpon,Permit,Marlin,Wahoo,Mahi-Mahi,Barjacks,etc.But it can be way more better!!!!! Capt Rosario is a great guy, friend and one of the best in PR.Did you know that he guided a flyfishing trip where a monster world record 224 lbs tarpon was caught?? ?They decided to let the fish go instead of claiming the record,thats the kind of person Capt Rosario is. The problem with Puerto Rico is that we as a society are not aware of the potential of the island. What we are doing to attract tourism?the answer: very little. Smaller islands, with considerable less resources are using their imagination and every thing at their reach to protect their natural resources. We used to have a very descent bonefish population, but now we don’t. Belize and Bahamas in the other hand, protect their bonefish and now they are some of the best destinations for bonefish, thus attracting tourism and making some good money. I think that we as fisherman can do more than we think. In my experience I know that senators will listen to us if we bring them ideas for legislation supported with good references. I mean not only information of the damage that gill net cause to the fish population in general, but also information regarding how much profit the island could do if the bonefish stock increase. For example, a healthy bonefish population means more charters, more international anglers, more room occupation, restaurant visits, rented cars, etc. Those are the things that politicians in Florida, Bahamas, Belize saw years ago. We need to convince our politicians about the potential of the island and how they can pass legislation to protect our fish stocks and making profit at the same time. I honestly think that we can do something, but we need to work as a group. Marvelous post on Puerto Rico Caught in the Past — Bonefish on the Brain – and solid domain by the way! So much potential. If only people would take more pride in their island. It needs to be taken care of. Too much litter, not enough regulation. Things are looking up. Regulations were recently passed to make bonefish, tarpon and permit catch and release only. That’s a step in the right direction. Hello fellow Anglers. I am a Fly-Fishermen from North-Central Arkansas U.S.A. , I fish world class Rainbow & Brown Trout on the White River in Americas Ozark Mountains. I am very excited to be coming to Purto Rico on January 10, 2012. I already have a Marlin/ Sailfish Charter booked. I am currantly doing research on Bonefish in Purto Rico. As a sportsmen & traveler I am surprised to find that there is little in the way of conservation of what should be a main staple in P.R. economy-Chartering and Guiding world class Angelers. If the other Islands are in ” Conservation ” mode it only makes scence that Purto Rico follow suit. Geographicly and Ecoligicly speaking the island is and should be a prime destination for Anglers from around the world to come and ” Wet a Line “. Belive me, when the Islands fishery begins to deteriorate, the Sport Fishermen/Women WILL go somewhere else. Yes, this will mean the loss of many millions of dollars and jobs for the people. More importantly, the dwindling numbers of fish will disrupt the entire balance of the islands waters. It will not end with one species , it will have a horrific cascading impact on EVERYTHING! For the Bonefish and others, I hope the islands human inhabitants can quickly get it together and preserve its diminishing bounty of game fish. It will require a massive team effort. I belive the islands Charter Captins and Guides should lead the way. They have the ability observe and speak firsthand of the current fishery conditions. They need to make habit of taking fish measurements, locations, feeding habits and documenting and reporting the locations of these Gill nets I keep reading about. Knowledge is power and with power comes the ability to envoke legislative change. I sincerely look forward to my Purto Rican adventure, but if the sport fish are scarce, it will be my last. Get the HOOK Wet, protect your Fishery so myself along with other world class anglers have a HOT-Spot to come to and do our thing.